1894 - 25 October, born in Nantes as Lucy Renée Mathilde Schwob, daughter of Maurice Schwob (1859-1928), owner of the journal Le Phare de la Loire, and of Victorine Mary Antoinette Courbebaisse. 1898 - Absences of her mother. First psychopathological crises which would lead Victorine Courbebaisse to confinement in a Parisian clinic. 1898-1904 - Lucy lives most of the time at the home of her paternal grandmother, Mathilde Cahun, in the large apartment of the Cambronne, at Nantes. 1906 - New inquiry in the Dreyfus trial. Incidents of an antisemitic nature at the girls school in Nantes. Lucy is intimidated by her classmates. 1907-1908 - Withdrawn from the Nantes school, she pursues her studies, which are especially brilliant, at an English boarding school, "Parson's Mead", in Surrey. 1909 - Lucy reintegrates into the Nantes school (for some subjects accompanied by private lessons). Beginning of a relationship with Suzanne Malherbe (born in Nantes on 19 July 1892). The Schwob and Malherbe families visited each other. First writings. 1909-1913 - Clandestine night-time readings in the bookshop of Le Phare de la Loire. Inhalation of ether. Anorexia. Suicide attempts. Interest in oriental doctrines. Practice of yoga. Long stays at Croisic (the Schwob family owned a small house there). Writes Vues and Visions (publication in Mercure de France in May 1914, under the pseudonym Claude Courlis). First photographic self-portraits. 1913-1914 - Regular collaboration with Le Phare de la Loire. Chronicle of fashion illustrated by Suzanne Malherbe (signed as Moore). Editing of Amor amicitiae (or Les Jeux uraniens), which remains unpublished. 1915-1916 - Meets the poet Marc-Adolphe Guégan and Jacques Viot. Visit to Jersey, staying at St Brelade's Bay Hotel. She returned every year until moving there in 1937. Meets with Robert S. ("Bob"). Intermittant and largely platonic meeting until 1925-1926. Choice of the pseudonym Claude Cahun. 1917 - Maurice Schwob marries Marie Eugénie Malherbe (née Rondet), mother of Suzanne. Claude moves in with Suzanne on the fourth floor of the Phare de la Loire, in a separate apartment. 1918 - Entry to the Sorbonne (department of philosophy and letters). Long visits to Paris, staying at the Avenue de Suffren. Collaboration at the Nantes journal La Gerbe, sometimes under the pseudonym of Daniel Douglas, and at Mercure de France. Frequents the bookshop Aux Amis des Livres on Rue de l'Odeon. Beginning of friendships with Adrienne Monnier and Sylvia Beach. 1919 - Meets Philippe Soupault at Aux Amis des Livres, who offers her work on Littérature. She did not dare to follow up. Publication of Vues et Visions by Cres. Connections with Chana Orloff and Jacques Lipchitz. 1920 - Claude and Suzanne take an apartment in Paris on the Rue de Grenelle. Photography. Claude shaves her head bald. 1921 - Visits the Galerie surréaliste on rue Jacques Callot. Meets Marcel Noll there. Portrait by the sculptor Chana Orloff (gilded plaster and bronze). Chanson Sauvage published by Mercure de France. 1922 - Work in the "atelier du fond", 70 bis, rue Notre-Dame-des-Champs in the sixth arrondissement of Paris, near Montparnasse. (They later occupied, at the same address, a better-lit studio "with a balcony onto the garden and a window onto the road". From July to September they stayed at Hotel St Brelade, Jersey. 1923-1925 - Contacts with the world of journalism. Collaboration on Paul Levy's Journal Littéraire. She turned towards theatre (connections with Marguerite Moreno, Ivan Mosjoukine, Ludmilla and Charles Pitoeff), but had to give up soon after. Gynaecological problems required surgery. 1925 - Meeting with Henri Michaux, via Jacques Viot, the beginning of a long friendship. Publication of "Récits de rêve" in a special issue of Disque vert (Number 2, 1925). She visits Pierre Morhange and the group responsible for Philosophies (Henri Lefebvre, Georges Politzer and, especially, Charles-Henri Barbier with whom she re-established contact after 1945). Publication of several new pieces in Le Mercure de France (Héroïnes). Gives her support to the "homosexual" journal Inversions. 1925-1927 - Collaboration at "Amis des Arts Ésotériques" (12, Rue Guynemer, Paris), then at the "Theatre Esoterique" (Adyar Hall, square Rapp). Close friendships with Constant Lounsberry and Béatrice Wanger (the dancer "Nadja") . Meeting with Georgette Leblanc, Jeanne Heap (organiser, with Margaret Anderson, of The Little Review, with Pierre Albert-Birot. Intense photographic work. Visits Jean Ryeul. 1928 - Death of Maurice Schwob. Difficult liquidation of the estate. Family quarrels. Completes a translation of Études de psychologie sociale by Havelock Ellis. "La femme dans la Société. I. L'hygiène sociale." was published by Mercure de France the following year. A second volume in progress could not be published. 1929 - Work in collaboration with Suzanne Malherbe in the creation of photographs to illustrate an autobiographical essay (begun more than ten years earlier). From February to May 1929, she was part of the company at the theatre Le Plateau, directed by Pierre Albert-Birot, together with Roger and Solange Roussot, Helene Duthe and Yasoshi Wuriu. She played "Elle" in Barbe bleue, "Monsieur de la première table" in Banlieue (two plays by P. Albert-Birot) and "Satan" in Le mystère d'Adam. At the end of 1929 she shaves her head again and creates several self-portraits. She collaborates in the creation of the dust jacket for the cover of a novel by Georges Ribemont-Dessaignes, Frontières Humaines. Meeting with Roger-Gilbert Lecomte. 1929 - Reproduction of a self-portrait in the journal Bifur (Number 5), titled "Frontières Humaines". Visits Georges Ribemont-Dessaignes and Pierre Lévy. Publication of Aveux nos Avenues (Carrefour, maquette by Claude Cahun and Suzanne Malherbe), with a preface by Pierre Mac Orlan (requested by Jacques Viot). Beginning of a long friendship with Robert Desnos. 1930-1931 - Family difficulties relating to the Maurice Schwob estate. Health problems. Numerous visits to Nantes. In Summer of 1931, Suzanne Malherbe has an operation. 1932 - She belongs, with the support of Yolande Oliviero, to the Association des Ecrivains et Artistes Revolutionaires (AEAR). She meets there Jean Legrand, Néoclès Coutouzis, Pierre Caminade (who form the "groupe Brunet") with whom she maintains close connections until 1937. Very active in the literary area. In April 1932, she meets André Breton (via Jacques Viot) and progressively links herself to the surrealist group. 1933 - She signs the declarations of the AEAR titled "Protestez" and "Contra le fascisme mais aussi contre l'impérialisme francaise". Meets Tristan Tzara, Gaston Ferdière, Salvador Dali, René Crevel, Man Ray. Responds to a questionnaire in the journal Minotaure ("Quelle a été la rencontre capitale de votre vie") [("What was the most important meeting of your life?")] and in the journal Commune ("Pour qui écrivez-nous?") [("For whom are we writing?")]. 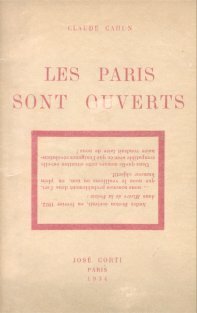 1934 - Publication of her pamphlet Les paris sont ouverts [Literally The Parises are open, Figuratively Bets are On] (José Corti). Complicated and affectionate relations with René Crevel. 1935 - Meeting with Vitezlav Nezval, the Czech surrealist passing through Paris. She participated in the establishment of Contre-Attaque. One of the meetings took place in her studio on the rue Notre-Dame-des-Champs. Meetings with Roger Caillois and George Bataille. Friendship with Jacques B. Brunius, Nicolas Calas. Ever closer relations with André Breton and Jacqueline Lamba. 1936 - She signs the majority of tracts eminating from the Contre-Attaque and from the surrealists. Attends, in the company of Néoclès Coutouzis, presentations of illnesses in the psychiatric services (La Salpêtrière, L'infermerie speciale du depot, Sainte-Anne where she meets Dr Gaston Ferdière again). Meeting with Jacques Lacon. She participates in the "Exposition surréaliste d'objets" at Charles Ratton's gallery. She conceives numerous "objets à functionnement symbolique" ["objects with symbolic functioning"], the source for a suite of "tableaux photographic". Publication of an article "Prenez garde aux objets domestiques" ["Beware of domestic objects"] in Cahiers d'art. In June 1936, she accompanies André Breton to London and participates discreetly in the organisation of the international surrealist exhibition (at "Burlington Galleries"). Intense photographic activity during August and September in Jersey. 1937-1938 - Publication of poems by Lise Deharme illustrated by twenty photographs by Claude Cahun: Le Coeur de Pic (José Corti), with a preface by Paul Eluard. In March 1937, Claude and Suzanne visit Jersey with a view to staying there permanently. On 24 July they bought "La Rocquaise" at St Brelade's Bay. They moved there permanently on 9 May 1938. Henri Michaux joined them on 24 November. Pursues photographic work. 1939 - She belongs to the Fédération International de l'Art Indépendant (FIARI). Close contacts with André Breton and the surrealists. After a stay of six weeks in Paris on quai Henry IV, at the home of her friends Lilette Richter and Néoclès Coutouzis, she welcomes Jacqueline Lamba-Breton and her daughter Aube (they stayed at "La Rocquaise" from 25 April to 26 May 1939). Signature of the declaration: "A bas les lettres de cachet! A bas la terreur grise" (FIARI, June 1939). Crisis of a "urticaire g�ant" in reaction to the war. 1940-1944 - Invasion of Jersey by the Germans (1 July 1940). From the arrival of the occupation, they opt for a "resistance active". For four years she conducted, without cease, with the complicity of Suzanne, activities of counter-propaganda and of demoralisation towards the occupying troops. Production of tracts, subversion of pro-Nazi magazines, photomontages. In March 1943 she underwent her first interrogation. On 25 July 1944 Claude and Suzanne are arrested by the Gestapo and put in military prison. Attempt at suicide. "La Rocquaise" is largely requisitionned, ransacked (furniture removed, libraries dispersed, archives - notably photographic - partly destroyed). On 16 November 1944 they are condemned to death by the German court martial. 1945 - They benefit, in February 1945, from a stay of execution of the sentence. A transfer to Germany is envisaged... But they must wait for surrender, 8 May 1945, to be freed from the St Helier prison... In July, Claude re-establishes contact with André Breton, who is still in New York. She takes to renewing her friends "d'avant-guerre" [pre-war]. She writes long letters, which are variations on her experience during these four years, to Jean Legrand, André Breton, Gaston Ferdière, Jacques B. Brunius, Henri Michaux... But, very much tried by her imprisonment, her health is profoundly altered. 1946 - She creates several photographic self-portraits and puts herself to creating a collection of notes on her resistance activity (Le Muet dans la mêlée). Start of an autobiography (Confidences au miroir). She envisages leaving Jersey to move to Paris. 1950-1952 - Long letters to Paul Levy, Henri Michaux, Charles-Henri Barbier... Awarding of the "Médaille d'argent de la reconnaissance française" for acts of resistance in Jersey (2 January 1951). 1953 - Hoping to renew more closely her connection with the surrealist milieu, speculating always on an eventual return to Paris, she visits Paris from the 3 to 20 June. She exchanges several letters with Jean Schuster who invites her to participate in surrealist activities... and goes two or three times to the Café de la Mairie where she finds André Breton, Max Ernst and meets Toyen. 1954 - Her health worsens throughout the year. Eye, lung and kidney problems. She died in the hospital of St Helier, in Jersey, on the 8 December (pulmonary embolism, cardiac arrest). 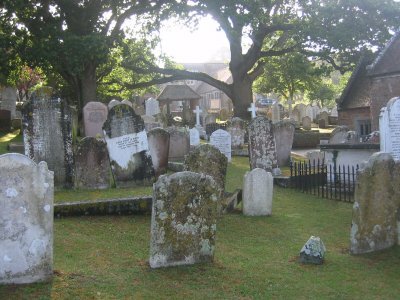 On her tombstone, in the marine cemetary at St Brelade's Bay, Suzanne had engraved a phrase from the Apocalypse of St John "And I saw new heavens and a new earth." 1972 - Death in Jersey of Suzanne Malherbe (19 January) in the small villa to which she retired after having sold "La Rocquaise". 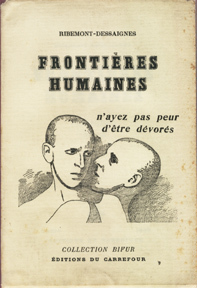 Taken from Claude Cahun: Ecrits edited by François Leperlier. Translated from the French for this website by Marcus Williamson. Additions by Marcus Williamson are shown in square brackets.